Weidner, 1924E. F. Weidner, “Altbabylonische Götterlisten”, Archiv für Keilschriftforschung, vol. 2, pp. 1-18, 1924. A number of scholars, including Weidner himself, posit that the WGL was a pedagogical text used to train scribes, a hypothesis further bolstered by the relatively recent discovery of the Ṭabatum manuscript, which was written in Old Babylonian by what appears to be an inexperienced scribe or student.2 The WGL presents a challenge in that the logic behind the order of the deities named is not clear—unlike the list An = Anum, which is ordered more or less hierarchically and by established Götterkreise, it is difficult to understand why the WGL includes certain gods and how they are organized. As Lambert suggests, “at least at the beginning the arrangement of the list is apparently theological. In many places, however, it is difficult to discern the principles of arrangement, if there are any, and it is uncertain if there is even one case of lexical arrangement. Either our knowledge of the deities is inadequate to grasp the basis of the arrangement or, more probably, various short lists have been compiled without any attempt at integrating them.”3 If the WGL indeed includes several pedagogical exercises, then this would partially explain why the logic behind the list is not clear to us. VAT 10173 is a first millennium text of the two subcolumn type from Assur and is written in Neo-Assyrian script. The tablet itself is structured in columns, with three columns on each side, although columns IV-V are poorly preserved. Almost nothing is preserved of column VI, and what looks like part of a colophon follows after the final ruling. Each column has a double vertical ruling down the center, which divides the first divine name from the added information. Many entries in the second subcolumn contain the syllabic pronunciation of logograms, ranging from common logographic writings such as utu and its syllabic reading šá-maš (Col. I line 13) to more obscure ones like nagar read as Ištar (iš-tar) (Col. III lines 37-39). Equivalents are also frequent, with one divine name equated to a (typically more familiar) divine name, sometimes grouped into series in which many divine names are equated with the same deity; see, for example, the Nergal subgroup in Col. I lines 26-34. The second subcolumn sometimes explains relationships between the gods, which usually explain female deities, such as dDamgalnunna and dDamkianna as the consorts of Ea in Col. II lines 5-6 and Uttu as the daughter of Anu in Col. III line 41. Non-familial relationships are represented by, for instance, dAlammuš as the vizier of dSîn in Col. I line 13. Epithets are rare, such as Nirah as the lord of the underworld in Col. I line 25 or Laṣ as the Lady of Eridu in Col. III line 21. VAT 10173 is one of three text fragments from Assur that Frahm has identified as possible commentaries to or expansions of the WGL.6 Due to the nature of the WGL and other similar god lists (particularly others that have split columns), the generic dividing line between base text and commentary is blurred, however, and the additional column of information could be considered commentary material or could simply align this exemplar more closely with lexical god lists like An = Anum.7 Thus, VAT 10173 is possibly not strictly a commentary but could rather be another exemplar of the base text. 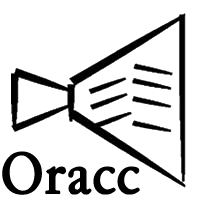 Indeed, Weidner edited this text as exemplar A in his composite reconstruction of the WGL.8 An edition of the single-column Old Babylonian WGL, including the other exemplars, can be found at http://oracc.org/dcclt/Q003908. The original edition of VAT 10173 was published by Schroeder, who had also done the hand copy, in 1921. 1. D. Shibata, “An Old Babylonian manuscript of the Weidner god-list from Tell Taban”, Iraq, vol. 71, pp. 33-42, 2009. P. 35. 2. See D. Shibata, “An Old Babylonian manuscript of the Weidner god-list from Tell Taban”, Iraq, vol. 71, pp. 33-42, 2009. Pp. 33, 35. For Nippur exemplars see J. Peterson, “Neo-Babylonian Exemplars of the Weidner Godlist from Nippur in the University Museum, Philadelphia”, N.A.B.U. Nouvelles Assyriologiques Brèves et Utilitaires, vol. 2008/37, 2008. Pp. 46-47. 3. W. G. Lambert, “Götterlisten”, Reallexikon der Assyriologie, vol. 3, pp. 473-479, 1957. P. 474. 4. See D. Shibata, “An Old Babylonian manuscript of the Weidner god-list from Tell Taban”, Iraq, vol. 71, pp. 33-42, 2009. P. 35. See also >W. G. Lambert, “Götterlisten”, Reallexikon der Assyriologie, vol. 3, pp. 473-479, 1957. P. 474. 5. D. Shibata, “An Old Babylonian manuscript of the Weidner god-list from Tell Taban”, Iraq, vol. 71, pp. 33-42, 2009. P. 35. 6. E. Frahm, Babylonian and Assyrian Text Commentaries. Origins of Interpretation. Ugarit-Verlag, 2011. Pp. 256, 271. 7. For parallels, see E. F. Weidner, “Altbabylonische Götterlisten”, Archiv für Keilschriftforschung, vol. 2, pp. 1-18, 1924. Pp. 81-82. 8. E. F. Weidner, “Altbabylonische Götterlisten”, Archiv für Keilschriftforschung, vol. 2, pp. 1-18, 1924.
dMišarum (is) the son of Šamaš? 1For the reading of the god’s name see Lambert, W.G. 2002. “The name of Nuska.” Revue d'Assyriologie 96: 57-60. Weidner (1924-25: 9) restores -ku. 2The copy consistently shows NIN instead of DAM. The reconstructed syllabic writing follows Cavigneaux 1981: 82-83, but Weidner (1924-25: 9) has Sa-dara-nun-an-na with the note that usually the goddess’ name is written Sa-dara-nun-na. In Neo-Assyrian sources, Šala is the consort of Nuska, attesting to the conservatism of this list as a scribal tradition rather than living practices in Assur. Babylonian sources name Sadarnunna as a spouse of Nuska, including in the later Neo-Babylonian royal temple building accounts. 3The copy reads BAD instead of GI, but see Weidner’s (1924-25: 10 fn. 1) correction. 4Only the divine determinative (AN) for the second name is rendered in the copy, but Weidner (1924-25: 10) very tentatively suggests a NE sign (also read li₉) after the determinative. An Old Babylonian copy of Diri preserves Lisi = AN.NE.SIg (http://oracc.org/dcclt/P447993 d ii 43) so one might speculate that this could also be reconstructed here as a different syllabic rendering of Lisi’s name. 5The reconstruction is consistent with other OB god-lists including An = Anum and is part of a theological change Lisi underwent, transforming from a female deity to a male one (RlA 7: 32-33). 6This scribe diverges from Cavigneaux 1981: 82, which has ŠEŠ.ZU. 7Frahm 2011: 256 fn. 1213 reconstructs Sîn’s name as written d30. 8The name might be written EZEN×GU₄, despite the copy, but Nin-EZEN can also be read Nin-Isina (RlA 9: 351, 374, 386-387), in which case Nin-Isina may be equated with Gula or Ninkarrak, disrupting the Sîn group here. This line diverges from Weidner’s reconstruction (1924-25: 10), where he reads the first name as Ninšer and the second as Harru for this exemplar. 9Amarra-hea’s name is preserved as damar-ra-ḫé-è-a in Cavigneaux 1981: 82-83 and Weidner 1924-25: 10. The copy shows I instead of HE₂ (GAN) and the second half of E₃ and the entire A sign are missing. 10This reconstruction is very speculative, but see RlA 9: 492-93. The first column could instead contain an alternate spelling of Ninšubur. Weidner (1924-25: 11) does not record this line, with his edition going directly from Ninšubur to Nanaya. He does, however, remark upon the circular nature of Ninšubur—Ilabrat—Papsukkal, who are all identified with each other (1924-25: 11 fn. 2). For instance, note that Papsukkal is mentioned below in Col. I line 44 as equivalent to Ilabrat. One might speculate that the line is a dittography of the previous line and should be reconstructed as identical. 11Weidner (1925-24: 11 fn. 4) claims that collation confirms the final la₂ in the first column but reads an -e in the second column of this line, as the copy seems to suggest, but notes in his following footnote “ist eventuell auch Zeile 21 als [mārat dNa-na]-a(!) wiederherzustellen?” It seems possible that the -e in the copy is actually an -a and part of the confusion may come from the fact that there is meant to be a line directly previous to this one that reads Nanaya = Nanaya. That line is absent in this exemplar, perhaps due to a case of homeoteleuton that resulted in the conflation of the beginning and end of two different lines. Bizilla’s original equivalent is, therefore, lost in this exemplar. 12See RlA 5: 389 and Weidner 1924-25: 11 fn. 5. 13Šara is usually the son of Ištar. Weidner (1924-25: 11) suggests for the second column “marat Marduk?” without further explanation. 14Weidner (1924-25: 11) was able to read the two final signs, which are not rendered in the copy. See Col. II line 25 for Nirah having the same epithet. 16This line is missing in the other exemplars that preserve this section (Weidner 1924-25: 12). 17Weidner (1924-25: 12 fn. 3) claims that he can see the UTU sign clearly on the tablet for this and the two following lines, but that the determinative is missing in all three. 18The NUN is missing one vertical in the copy. The reconstruction is based on Weidner 1924-25: 12, but is consistent with Papnunna’s historical role (see RlA 10: 327). 19Weidner (1924-25: 12) very tentatively reconstructs dšú-ut-tu. This line is missing in the other exemplars that preserve this section. 20See RlA 9: 481. This line is missing in the other exemplars that preserve this section (Weidner 1924-25: 12). 21See RlA 9: 513. The reconstruction of MAŠ is given here based on the available space on the tablet. 22See RlA 9: 513 for the equivalence between Uraš and Ninurta. 23The traces in the second column of the copy look like the line should end in U.GUR but Weidner (1925-24: 13 fn. 3) claims to read Ninurta in collation. 24Weidner (1924-25: 13) reads the line dMAL (GA₂) & !cm dNinurta. DCCLT and other exemplars of the WGL start with Ilaba, Cavigneau (1981: 84-85) has GA₂ in this and the following line in the first subcolumn but does not suggest a reading. DCCLT gives the reading Ila-ba₄ for AN.GA₂. 25As with the previous line, Weidner (1924-25: 13) reads dMAL(GA₂) & !cm dNinurta, noting that the D exemplar has dŠamaš instead. See above note for Cavigneaux reading GA₂ in the first subcolumn. 26This line is found in only two exemplars in Weidner’s edition, both of which are Assyrian. 27Weidner (1925-24: 13 fn. 12) tentatively suggests E-ta?-lak?, see also RlA 11: 530. 28Weidner (1924-25: 14) reads šu₂. This manuscript skips a line that equates Imzianna with Gula. 29Weidner (1925-24: 15) reads díd-lù-ru-gù (the river ordeal) for the first name, which is also in the DCCLT edition. 30The DCCLT edition reconstructs the first names in line 14 and 15 in the opposite order (i.e. AK in this line, na-bi-um in the next) but Weidner (1924-25: 15) gives this sequence. The copy does not clarify the issue. 31Weidner (1924-25: 15 fn. 7) suggests that, since this line does not appear in the Old Babylonian versions, AK is a later writing for Nabu’s name. See also the note to line 14. 32Weidner (1924-25 15) notes that the Neo-Assyrian exemplars skip a line that equates Mamme with a deity whose name is lost. 33The reading of the first name follows DCCLT and An = Anu col. II line 260. 34Anu rabû “Great Anu” is another name for Ištaran. 35For the reading of the sign KU₅ in this and the following line, see the DCCLT edition. 37Cf. Col. I line 27, where Ninazu is given the same epithet. 38See RlA 5: 173 for Išar-names. The reconstructions for the writing and reading of the first names in this and the following Nergal names are in DCCLT and Weidner 1924-25: 16-17. 39The copy shows some traces for the first name, possibly part of -ri and the beginning of -su. 40The appearance of Irra between Nerigal and Irragal diverges from the DCCLT edition, which has Irragal coming first. 41Weidner (1924-25: 17 fn. 5) was able to read -ra-gal through collation. 42Weidner (1924-25: 17 fn. 5) was able to read -kal through collation. 43The signs in the copy look like “Ningal,” but Weidner (1924-25: 17 fn. 7) read DAM-su through collation. 44Other exemplars switch the order of lines 35 and 36 (Weidner 1924-25: 17 fn. 7). 45Weidner (1924-25: 17 fn. 9) could read part of -šum through collation. 46Weidner (1924-25: 17 fn. 11) could read -la₂ through collation. This exemplar moves a line that equates dLaṣ with dBaʾu from preceding this line to Col. II line 41, below, but in reverse order. 47This exemplar swaps the order of the deities here, see note to Col. II line 39 above. If this was done purposefully, it may suggest that Laṣ was the more familiar deity to an Assyrian scribe. 48Weidner (1924-25: 18 fn. 3) thought the reading Mulliltu was not very likely, but if TUM is read (rendered erroneously in the copy as DU.I), it would confirm that reading, see also RlA 9: 469. 49Weidner (1924-25: 71) suggests “dDilbat (is) dIštar,” the DCCLT edition has the deity A’ušar where this line would fall. 50The copy gives only the first wedge of the divine name; Weidner (1924-25: 72) tentatively suggests PAP, and DCCLT’s edition of the Weidner God List has the god Ašgi (written aš₇aš-gi₄) in the list above the next god. 51Weidner (1924-25: 72) suggests Ninurta in the second place based on other material. 52This diverges from Weidner’s edition, which has Nergal instead. Weidner (1924-25: 72) suggests that the second place is Nergal from this line through line 17, which extends the Nergal group preserved in lines 18-20 so that it begins here. 53Weidner (1924-25: 72 fn. 10) suggests a-ri-tu₄ in second half. 54The divine name in the second space is the one that is lost in the previous line. This format is used in god-lists such as An = Anum. 55See note above. The fourth vertical of NUN is consistently missing, but the writing of Eridu and then NUN elements in following divine names may be the connecting principle here. 56Weidner (1924-25: 73) suggests the second writing is the phonetic pronunciation. DCCLT has dma-gal-la before this line. 57The DCCLT edition has degi-zi-da, allowing secure restoration even though Weidner (1924-25: 73) has zi₂(d)?-zi. See line 42 for Ningizzida again. 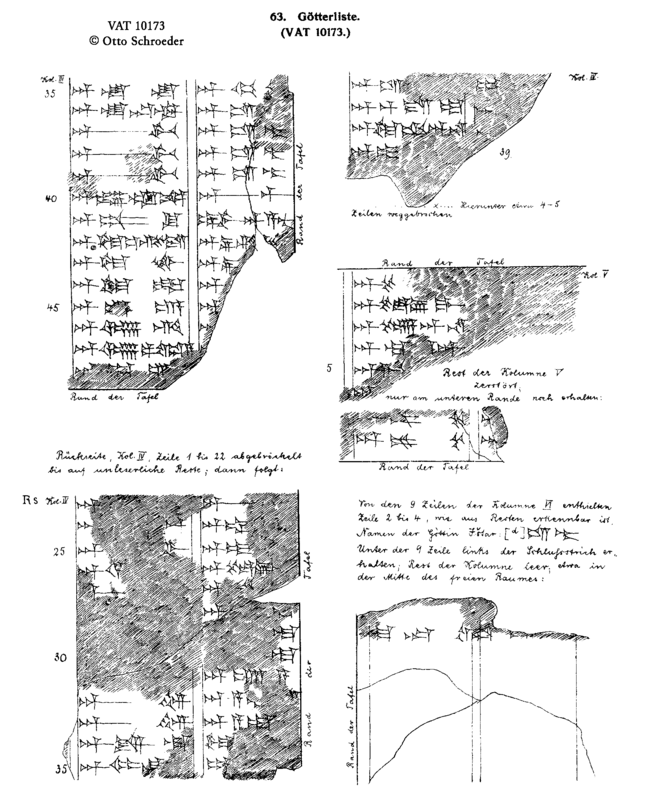 58Reconstruction of lines 29-32 follows Weidner’s (1924-25: 73) collation of the tablet. 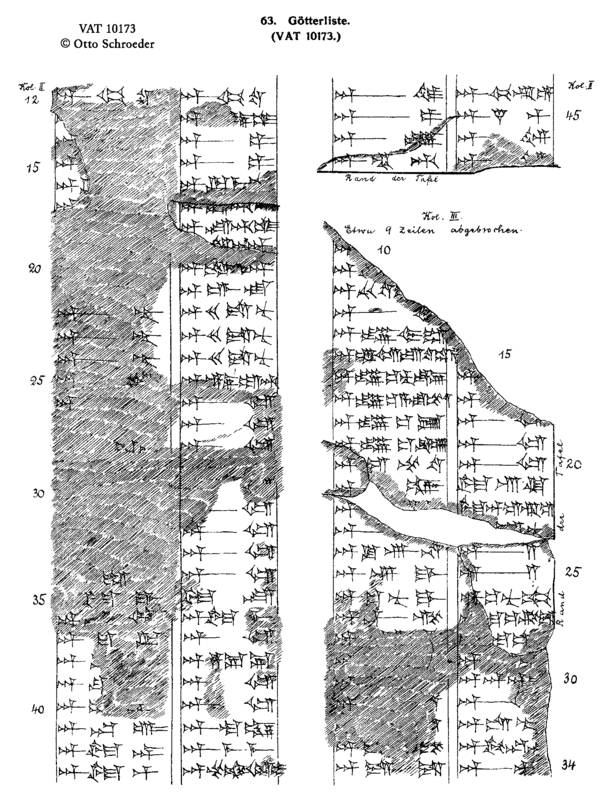 59Reconstruction of lines 29-32 follows Weidner’s (1924-25: 73) collation of the tablet. 60Reconstruction of lines 29-32 follows Weidner’s (1924-25: 73) collation of the tablet. 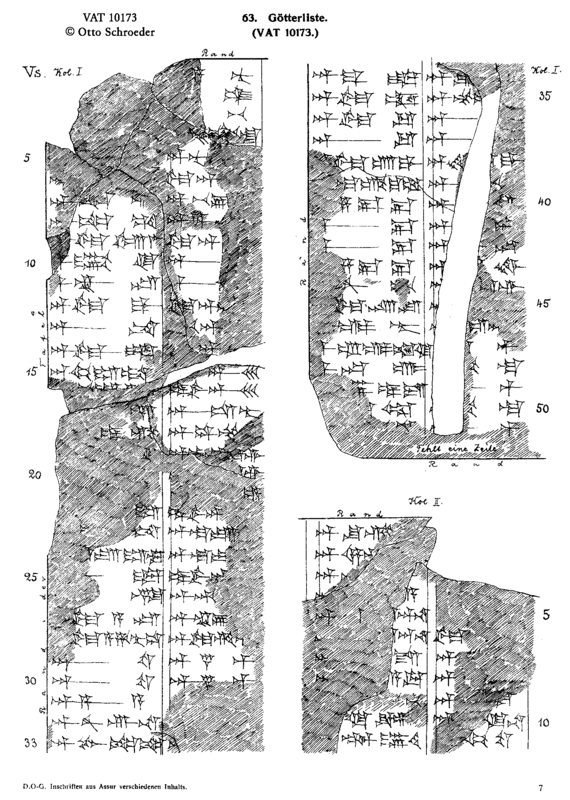 61Reconstruction of lines 29-32 follows Weidner’s (1924-25: 73) collation of the tablet. 62NAGAR is read here as alla, following DCCLT and MZL: 454. 63It is not clear how the sign NAGAR should be read in this and the following line; possibly they should again be dAlla, like in line 37. 65The second spelling looks phonetic, favoring this rendering of the GIŠ sign rather than Ningišzida. 67This diverges from the DCCLT edition. 68See Weidner 1924-25: 75 fn. 6 for the restoration of this line. 69See Weidner 1924-25: 75 fn. 7 for the restoration of this line. 70See Weidner 1924-25: 75 fn. 7 for the restoration of this line. 72The copy preserves the determinative and what looks like a MAŠ at the end of the first subcolumn, but see Weidner 1924-25: 76 fn. 1 for the restoration of this line. The expected divine name here is Pabilsag or Hendursag (see DCCLT). 74The copy clearly shows Ea in the second subcolumn, but Weidner (1924-25: 76) reads Marduk (dmar-duk), although a syllabic spelling of Marduk is quite unusual. He tentatively restores dAMAR.UTU in the first column, though, which would suggest that the syllabic spelling is a phonetic rendering of the logograms. Another option is that the first name is actually dMAR.TÚ (Amurru), who is associated with Ea. 75The reading of the line this follows Weidner’s collation (Weidner 1924-25: 76 fn. 7). 76Instead of aššat Adad, Weidner (1924-25: 76 fn. 9) reads NIN DUG₂.G[A], i.e. bēltu ṭābtu, “the good lady,” suggesting that it is an explanation of the goddess’s name. 77Weidner (1924-25: 76) suggests Šamaš without explanation, but presumably this is because mīšarum means “justice,” which Šamaš is affiliated with as the divine judge. 78See Weidner (1924-25: 77 fn. 2) for the collation and how the order in lines 35-39 in this exemplar is different from the other exemplar that preserves this section. 79See Weidner (1924-25: 77 fn. 3) for collation. See Weidner (1924-25: 77) for the missing lines from other exemplars, with the caveat that they might differ from what was actually on this tablet. 80See Weidner 1924-25: 78 for the collation. 81See Weidner 1924-25: 78 fn. 6 for the collation. 82See Weidner 1924-25: 78 for the restoration and 78 fn. 8 for the suggestion that the traces in the second subcolumn read KASKAL. 83See Weidner 1924-25: 78 for the name dKabta in the first subcolumn. For the following lines, he claims in footnote 10 that lines 7’-10’ preserve the divine determinative in the second subcolumn.